This amazing new Rockin Rapids 22 foot tall water slide features a super fast sliding surface and easy to climb steps with hand rails. This water slide has a bumpy slide surface giving the slider a much faster ride similar to water slides at a water park. This 22' tall water slide has a really shallow splash pool area at the bottom with a drain built in so the water stays very clean while in use. This water slide must be set up on real grass in good condition. We have a bigger log themed water slide so be sure to check out our 21 foot tall Wild Rapids water slide or 31 foot tall Log Jammer Extreme. We do not set up water slides on dirt, sand or grass in poor condition. 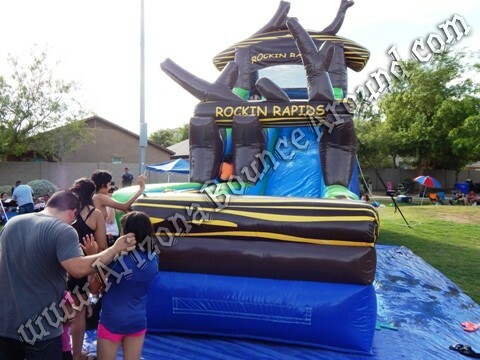 Gravity Play Events is your inflatable water slide rental super store with the best selection of Inflatable slide rentals in Colorado like this new 22 foot tall Rockin Rapids inflatable water slide. Our 22 foot tall Rockin Rapids water slide is great for all ages from kids to adults. It's easy to climb and is the perfect water slide for special events or birthday parties. Our Rockin Rapids Water Slide has a bumpy slide surface for a great ride down to the end. This water slide features a great landing area with no pool water to get dirty. It features a unique drain system so the water spraying from the top get drained out of the bottom of the landing area keeping the slide fresh and clean during use. Our Rocking Rapids water slide has seperate entrance and exit for high volume events making it easy to control the lines. You can also go right back up the slide without exiting for parties with smaller attendance like a birthday party or summer fun day.